Join us for this festive event to kick off the Holiday Season! Make new contacts, explore what area businesses have to offer, and enjoy delicious food and drinks! Showcase your product or service to the business community!! Table space is limited and the deadline to register as a Business Expo vendor is November 30, 2018. 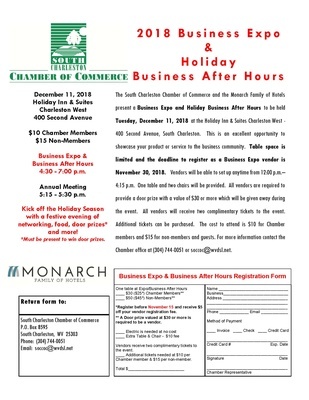 Vendor Space is $30/Chamber Members or $50/Non-Members. One table and two chairs will be provided. All vendors are required to provide a door prize with a value of $30 or more to be given away during the event. All vendors will receive two complimentary tickets to the event. Additional tickets can be purchased for $10/Members or $15/Non-Members.